Best Waders for Duck Hunting 2017 - Top 5 Best Choise for You! Duck hunting is a rugged and messy activity in water.Duck Waders come in handy as this game can land you in wet and muddy situations. Having good and appropriate waders can make a significant difference in your waterfowl hunting success rate. Waders will keep your body and feet dry till when you are ready to come out of the pond. In this article, we have picked the top performing waders in the market and highlighted their qualities to give you a gist of what quality duck hunting waders look like. But before we get there, let’s inform you on how to choose the best waders for duck hunting. The best hunting Waders come in different ﻿﻿materials, the most common being Neoprene, Rubber, Gore-Tex and Nylon. Neoprene waders are efficient when hunting in areas where the temps plummet down to freezing conditions. They’ll keep you warm and keep in mind that the thicker they are, the warmer they’ll be. Rubber waders are known for being cheap, warm and long-lasting. However, they are not breathable and not much comfortable either. Gore-Tex is among the newest and expensive waders because of the high-end materials used. Yet, it’s waterproof, breathable, durable and comfortable. Waders made of nylon tend to be lightweight, comfortable and less hassle to wear and take off. They are ideal for summer hunting because of their good ventilation. Any swamp land hunting outfit needs to be camouflaged to increase the success rate. Otherwise, there’s no point of stalking game if they can clearly sense your intentions. For you to pick appropriate gear, know your hunting location so you can pick camo patterns that match the area. Also remember different seasons arrive with unique camouflage, so it’s recommended to have waders for various seasons. Consider features like breathability and water-resistance as they contribute to comfort. Your body needs to be sweat free to avoid quick fatigue. Obviously, you don’t want to feel awkward in your movements. Waders that offer a snug fit encourage motion without restriction. Consider waders with good boot configuration to keep away mud from sticking to you’re the boots while wading. Boots with reinforced knee pads protects against knee injury while moving across the thick marsh. This product comes from Frogg Toggs with the love for dirty work. First, they come tall and rest chest higher than most regular waders. This means you can waterfowl in somehow deeper waters without getting your upper body wet. This hunting gear is sturdy and durable; finished with a 3.5mm neoprene material with well-constructed seams. The knee pads are reinforced to make it sturdier. The boots are equipped with 600-gram Thinsulate to keep you warm in the coldest waters. The wader is easy to fit thanks to the adjustable suspenders. Just hook-and-loop the attachment and you are ready to go. What makes it a go-to product for waterfowling is the Realtree MAX-5 finish. There’s a dual entry hand-warmer pocket strategically placed around the chest in case you might want to warm up. A storage pocket is also available for keeping small gear. The boots run a size larger. The Amphib is extremely comfortable and will guard you well while in the swamp. Nothing beats these waders when it comes to duck hunting. Made from 5mm neoprene material, they are super comfortable. The neoprene is held together with double-stitched and bonded seams on the interior. On top of the neoprene is a combined layer of spandex and Lycra for extra durability. On the outside it’s a liquid rubber coating that protects against abrasion and water as well as providing uncompromised durability. The Best Waders for Duck Hunting 002These waders boast 1000 grams Thinsulate in the boots for unmatched warmth in cold weather. The uppers are fleece lined to provide extra comfort. It also carries a shotgun shell pouch which of course is removable. 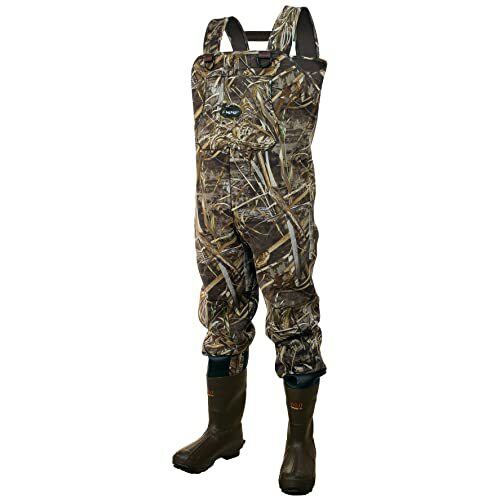 The waders fit true to size and the camouflage is well designed to match into open fields and marshes. There is even adjustable shoulder straps and waist belt for an adjustable, proper fit. The boots have an Ankle-fit design which prevents heel slippage and chafing. Adjustable shoulder straps and belt.Ankle-fit boots design. These are the best waders by some distance, no wonder they are the award-winning waders of Field and Stream, but you have to watch your wallet. Hodgman believes you don’t have to break the bank for a quality pair of waders. That’s why they design these inexpensivewaders to take on the fields. Made from rugged and heavy denier PVC, the textile is well constructed with a nylon coating thatprevents water from leaking inside the waders. They are lightweight waders boasting to be 35% lighter than traditionalrubber chest waders. You won’t experience any restrictions to your movements. The PVC boot attached to the wader has 25% extra durability than rubber. It’s also ultra light allowing you to trek effortlessly without being worn out. You’ll love these boots as they’ll take you wherever tricky places the ducks escape to. The waders have adjustable suspenders that come with on and off buckles to allow for a personalized fit and comfort. There’s even an internal pocket to keep your essential gear safe. 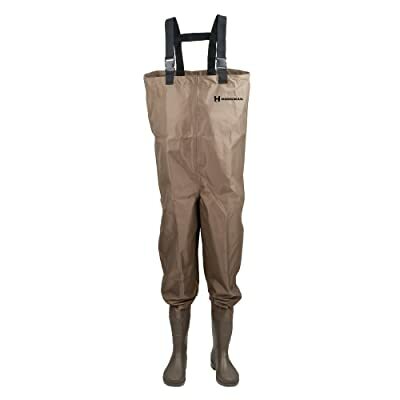 If you are looking for budget-friendly waders, the Hodgman Mackenzie is an excellent choice. Don’t be fooled by their cheap price, they are great performers. These waders come in sizes 8-14 only which fit true to size. You might want to buy a size larger if you plan to hunt during thecold season so you can have room to add inner warmth layers. Featuring Realtree MAX-4 camouflage attached with adhesivetape, the waders are heavy duty yet lightweight. They are constructed from neoprene material which resistant to water. You are certain to keep your feet dry after many hours out in the wetlands. They have lug sole boots insulated with neoprene for warmth and a comfortable fit. You’ll get enough heat and stay protected. In addition, they have a supportive knee and shin region that offer the needed durability in the harshest conditions. 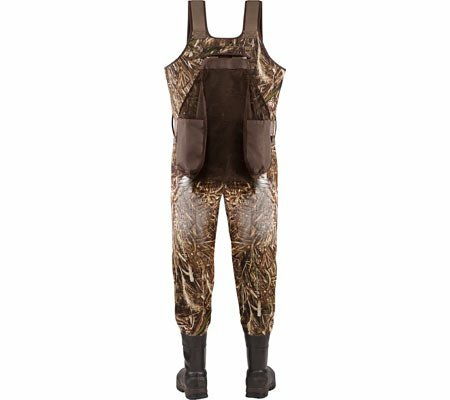 If you prefer to go hunting in hot weather, t﻿﻿hese ﻿﻿waders are hig﻿﻿hly breathable. They’ll wick away sweat while allowing you to hunt under hot temps. There are also adjustable nylon-made suspenders with one and a half inches wide webbing to allow for easy movements in the tight waders. Furthermore, they have a front pocket which holds up to 9 shot shells. Those who have a slim built also have room; there’s an optional belt to assist you to get a proper fit. Adjustable suspenders and optional belt. Supportive knee and shin area. Boots can lead to discomfort after long treks. Boots tend to fit a bit smaller. 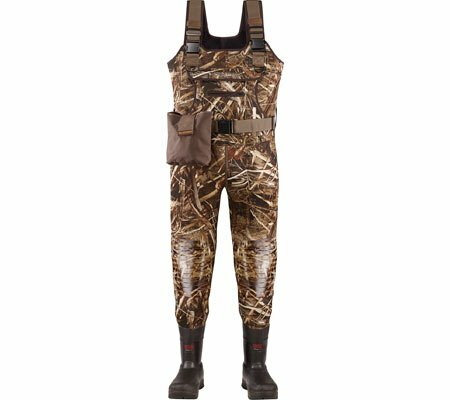 Pick these waders if walking around the marsh in lightweight gear matters to you. They also sell at a good price. This product from Allen comes in a nylon knit with Mossy Oak Blades camo garment. These are great waders to keep you unnoticed while in the cattails, marsh and even standing corns. Made from 3.5mm neoprene material, the waders can stretch accordingly to fit your body. In addition, there are web suspenders that can adjust for a proper fit with D-rings on the front and back. So even if you are taller than 6 feet this wader will cater for your height. The boots that come with these waders have a steel arch for better foot support. Even more, they feature 1000 grams Thinsulate insulation to keep you warm when waterfowling in cold waters. The reinforced knee pads are also extra thick for increased protection while hunting in the toughest conditions. Another great stuff with these waders is the high back design, web waist belt and handwarmer pocket. The belt provides a snug fit around your body. Waist belt and hand warmer. Great insulation around the foot. The boot’s seam is weak. Boots are a bit heavy. These are among the most durable waders that come at a fair price. No doubt, the 1000 grams Thinsulation will keep you warm and dry for long periods. By now you know that duck hunting demands the toughest waders. If you want to succeed in this game, try some of our top recommendations. Word of advice, when shopping; remember to check the price vs. the valuable features that come with your choice of waders.